Let’s get started! Click the Schedule Appointment Online button to the right to reserve your Appointment. Our team of dental implant specialists will replace missing teeth, giving you natural, healthy-looking results. Our orthodontists provide exceptional care for both children and adults. Our cosmetic dentists will give you that runway smile with customized dental veneers. See what options our teeth whitening dentists have available to give you a brighter smile. Call 215.348.4041 to get in touch with our 24-hour dentists. Welcome to American Dental Care and Orthodontics, a local dental practice serving Doylestown, Chalfont, New Britain, and its surrounding areas, where patients can expect only the best care and service. Our team works together to perform each treatment at the highest level of professionalism, making sure each patient receives a positive, comfortable and relaxing experience every visit. Whether you are in need of a simple routine dental cleaning or a more involved dental surgery, your oral health is our top priority. Find out why so many people love our team and make an appointment with our family-oriented practice located in Doylestown today. Our staff can perform the most advanced treatments in general dentistry, endodontics, periodontics, orthodontics, oral surgery, and implant services. The team at American Dental Care and Orthodontics is looking forward to helping give you the healthier, confident smile you deserve. Dr. Fouad joined American Dental Care and Orthodontics in 2003 and is passionate about providing exceptional dentistry that makes a difference in her patient’s lives. Dedicated to pursuing excellence in the art and science of cosmetic dentistry, she offers her patients the most advanced treatments available. There are times when out-of-pocket costs get in the way of getting the dental care treatments you need. Fortunately, CareCredit has an affordable low-interest financial alternative that can allow you to obtain the treatment you need. Apply online now and take the first step toward a confident smile. Our Doylestown Dentists Offer The Most Advanced Dental Care. American Dental Care and Orthodontics has provided residents of Chalfont, New Britain, and neighboring communities with the highest-quality routine and emergency dental care services for nearly two decades. It is our dentists’ goal to give you that confident smile that you’ve always dreamed of through our many painless dental care services. 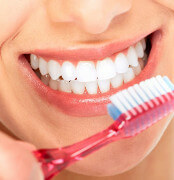 General Dentistry: Routine cleanings and teeth evaluations are critical to your oral health. Our team recommends scheduling a routine dental visit once every six months to prevent any serious issues in the future. These routine appointments typically take no more than a half hour to complete, and they are quick and painless! Composite Fillings: These are commonly used to prevent teeth from decaying further. At our dental office we offer composite fillings that match the natural look and color of your teeth. This can be done in one appointment. Dental Implants: These look, feel, and function just like natural teeth and are commonly used to fill any gaps where teeth may be missing. They can also be used to provide a method for attaching dentures that can even be snapped in and out for a secure fit and easy cleaning. Contact our local dentistry office to learn more about how implants can improve the quality of your smile and life. Endodontics (Root Canal Therapy): Sometimes it is necessary to perform a root canal in order to save a tooth from a serious infection. In most cases we can treat the tooth with great success, alleviating discomfort and providing a tooth structure which can be restored with a perfect crown. Periodontics (Gum Treatments): Healthy gums are essential to maintaining healthy teeth and avoiding bone loss. Periodontal treatment can help restore optimal health to teeth and gums. American Dental Care of Doylestown can determine your gum health during a routine visit and take the correct measures if necessary. Invisalign (Invisible Braces): Invisalign uses a series of custom-made clear retainers that move teeth gradually over time. Compared to traditional braces, Invisalign is a much less invasive treatment option. 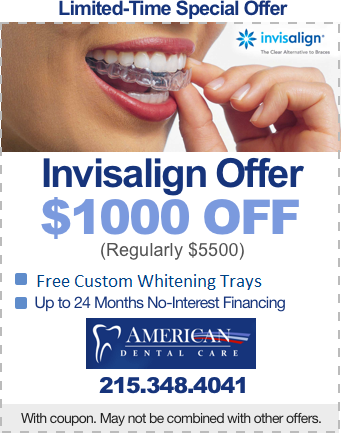 Contact our local office to see if you’re a good candidate for Invisalign braces today! Oral Surgeries: We have an oral surgeon on staff to handle any dental procedures such as wisdom teeth extractions. Crowns and Bridges: We do all types of restorative dentistry, including porcelain crowns for teeth that are severely broken or chipped and dental bridges to fill in gaps where teeth may be missing. Both crowns and bridges are custom made for each patient, so there is a perfect and comfortable fit for years to come. Dentures/Partials: We offer dentures and partial dentures that are affordable and look just like your real teeth. The dentists at American Dental Care and Orthodontics can discuss all of your options and find the best treatment solution for your needs. Orthodontics: We offer Traditional Braces, Esthetic Clear Braces and INTERCEPTIVE ORTHODONTICS with step-by-step treatment during child development and ACCELERATED TREATMENT OPTIONS for adults looking to improve their smile in an accelerated timeline. We are here to fulfill all of your cosmetic dentistry and general dentistry needs. Scheduling an appointment is easy and can be done by calling 215-348-4041 or filling out an appointment request form on our website. If for some reason you need to reschedule your scheduled appointment, we ask you do so 72 hours in advance. Our office is conveniently located on Easton Road in Doylestown, PA 18902. When you reserve an appointment, our team is scheduling time only for you. Our staff asks that you kindly notify us if you will not be able to make your appointment. If you must reschedule, please inform us at least 72 hours in advance so that we may adjust our schedule. “We cater to cowards” is American Dental Care’s slogan because we know visiting the dentist can be stressful. Our staff continues to maintain or small town values while utilizing state-of-the-art advanced family dentistry. Patient’s care is number one! Our compassionate and caring staff will treat you like family. We offer patient care at an affordable price, with convenient payment options. Leading edge optical technology from Carl Zeiss, has opened up a window to the dental Microcosm allowing a higher standard of care. Just one of the latest technologies American Dental Care offers to their patients.